Part of what makes food cooked outdoors so especially delicious is the “smoke flavor” it takes on from cooking over a wood or charcoal fire. But to really absorb smoke, usually takes time – much longer than many foods take to cook. The secret to delicious BBQ is low and slow cooking. To cook that way, you need big pieces of meat – think pork shoulders, briskets, full racks of ribs, whole hogs. Try that kind of cooking on a hamburger or even a steak and you’ll end up with a dried out, mealy waste of your fine food dollar. And what about adding smoke flavor to other foods like vegetables, cheese, or even butter and eggs? No matter how long you’re able to expose food to smoke, it will take on more flavor if the surface is sticky and/or fatty. A way to maximize these characteristics is with a marinade like the Bass Pro Shops Uncle Buck's Lime Marinade/Grilling Sauce. Whether your camp menu includes fish, vegetables, poultry, or red meat a simple three-ingredient vinaigrette will work well. For the simplest solution, buy a bottle of inexpensive premade marinade, but it’s nearly as easy to whip up the same thing in camp – and what herbs and spices to include is entirely up to you! Tip: Bass Pro Shops offers a wide range of outdoor cooking marinades, seasonings and sauces. Check out the selection here. The starting point is the proper ratio of ingredients – two parts oil, one part vinegar, one tablespoon of your favorite spice mix selected for the food you wish to marinate. Mix ingredients to the proper ratio in a 1-gallon zipper-topped bag. Add food to be marinated and seal bag. Knead bag gently to distribute marinade over all food surfaces. Pour off excess marinade and discard. Cook as normal over a wood or charcoal fire. If your cooking on an outdoor grill – whether it’s fueled by charcoal, gas, or propane – you can boost the amount of wood smoke contacting the meat during the cooking process. Take a handful of wood chips like Jack Daniel's Wood Smoking Chips or pellets of the kind used in smokers and soak them in water (or beer or wine) for at least half an hour, better an hour or more. Lay out a sheet of heavy duty aluminum foil about 14-16 inches long. Drain the excess water from the wood chips or pellets, then lay them in a pile lengthwise with the foil. Fold the foil up around the wood and crimp the open edge and ends to create a foil packet. Using the tip of your pocket knife, poke a number of holes through the top of the foil packet. Prepare the fire in your grill and lay the packet directly on the heat source. When smoke begins to appear through the holes in the foil, cook the food as you normally would on the grill – just be sure to keep the grill lid closed as much as possible during cooking. If the grill does not have a lid, carefully cover it with foil as best you can or at least tent the food with foil to keep the smoke around it as much as possible. Another great way to add smoke is with the A-MAZE-N Products tube Pellet Smoker. You load it with pellets, light it, and it add delicious smoke no matter what you’re cooking in. It raises the temperature very little yet provides ample smoke, so you could even smoke inside a bucket with it! It’s perfect on its own for smoking cheese, nuts, butter, or salt. In combination with a grill, it is an excellent smoke booster without the hassle soaking the pellets or making the foil packet. You may have seen “planked salmon” on the menu at fancy restaurants, but cooking fish … and a ton of otherfoods … on planks is a traditional camp cooking method that originated in the Northwest. The most traditional wood for cooking planks is western red cedar, but they are also available in a wide range of other hardwoods including alder, hickory, and more. Another term of this kind of cooking is called “stoking” because it combines both steaming and smoking to deliver delicious flavor and maintain moisture in the food. Tip: Cooking on planks couldn’t be much easier. Bass Pro Shops and Cabela’s both sell grill planks. In the meantime, prep the food you’re going to cook and start the fire. When ready to begin, remove the plank(s) from the water and shake off any excess. If you’re cooking something like a steak or hamburgers, quickly sear the outside of the meat on direct heat. Place the plank over direct heat until it begins to smolder, then move to indirect heat and place the meat back on the plank. Heat until internal temperature of meat is five degrees below the desired doneness. You can also cook foods like pizza and meatloaf on grilling planks. The heat source for cooking on planks can be a grill, an oven, or even a bed of coals in a campfire. To learn more about camp cooking, check out 50 Campfires Ultimate Guide to Stoking: Cooking with Steam and Smoke. 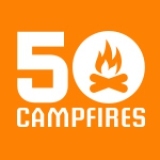 50 Campfires is America's camping authority. Our mission is to provide trending information, articles, reviews, recipes, camping locations, how-to’s, and 101 advice to help family car or RV campers enjoy every minute they spend in the outdoors. How Do You Know If You’re Camping or Glamping?